Alexey Pajitnov may not be as well known as John Carmack or Sid Meier, but in 1988 he brought Tetris to the raging masses, causing the biggest case of puzzle lock since a man named Rubik unleashed his eponymous cube to an unsuspecting audience. Since then he’s been steadily putting out game designs, having secured a job with Microsoft that spanned almost ten years. 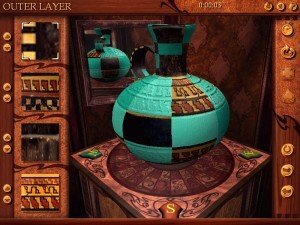 It’s during his time with Microsoft’s game design department that he worked on Pandora’s Box, an interesting amalgamation of slow-paced puzzles for those not looking to get anywhere in a hurry. 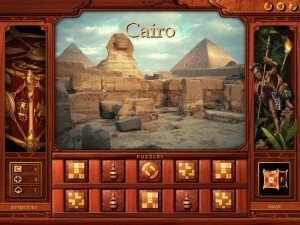 Pandora’s Box puts a little spice in the mix, centered on the titular vessel. It seems that in addition to being the origin of all evil, the box (or jar, or oversized shoe box) was a convenient prison for some of mythology’s favorite malicious deities. 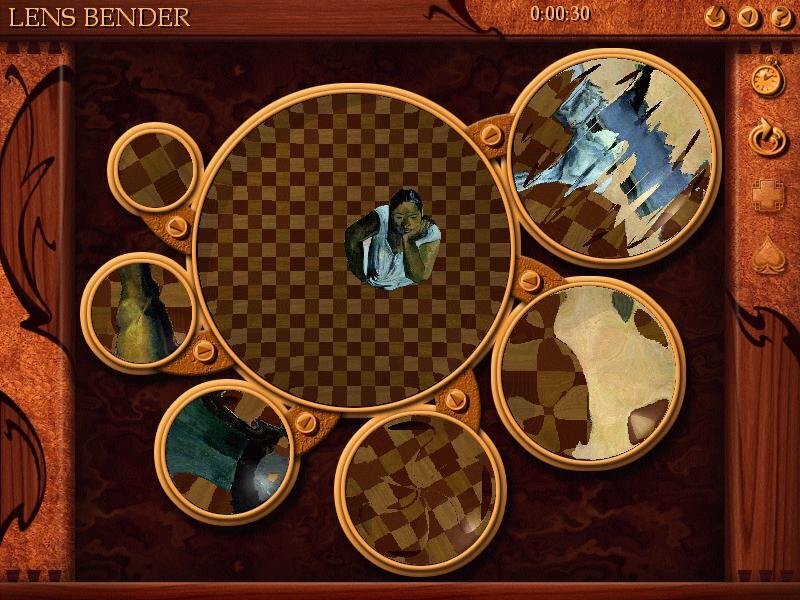 The box has seven sides for seven tricksters, each side has five pieces, each piece has one city and each city has ten puzzles. 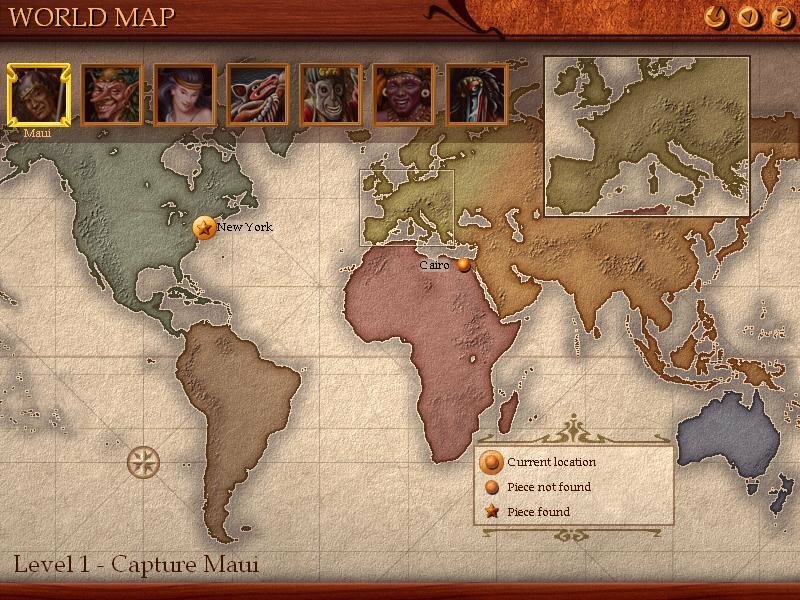 There are several “levels” in the games, each involving a different location and theme. 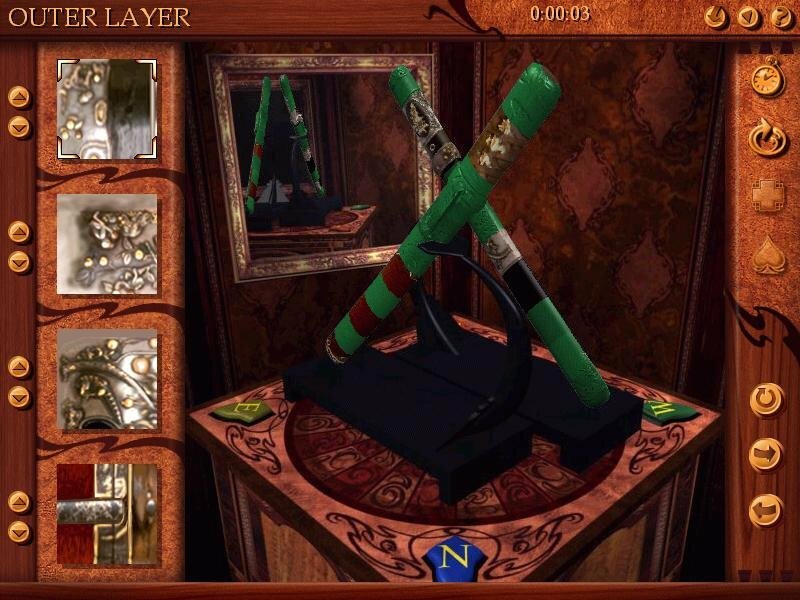 A mellifluous disembodied voice narrates a fable involving the current quarry, with periodic pauses in which you have to embark on a Sandiego-esque trek about the globe to track down pieces of the box. 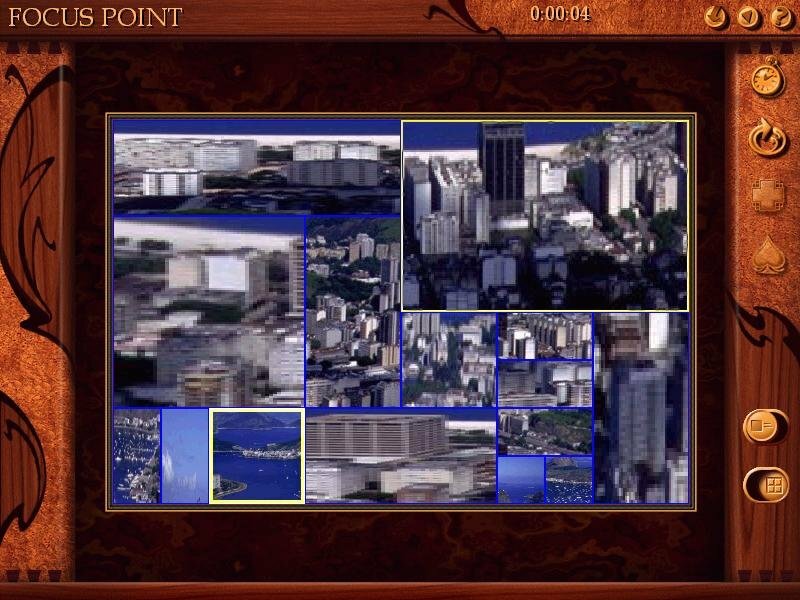 Each piece is in a different city, hidden behind one of ten puzzles. 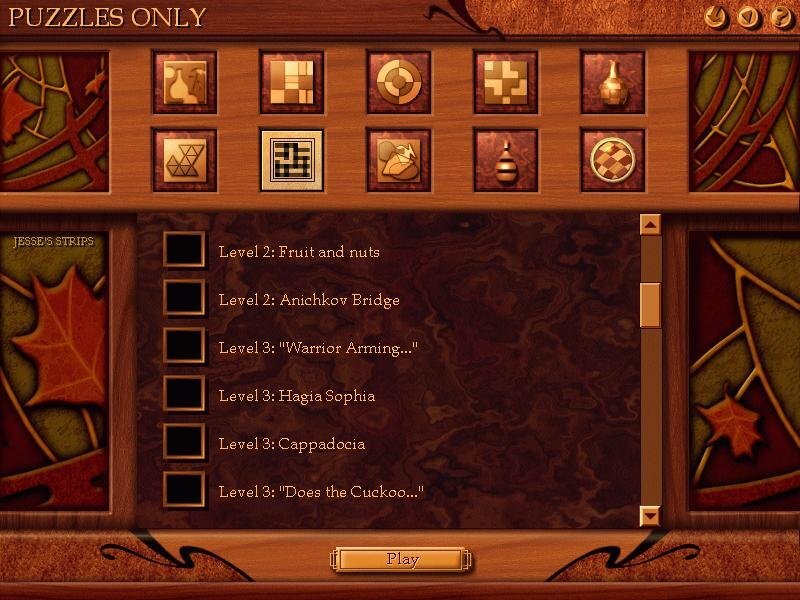 This rudimentary search would probably be enough to hook in most gamers, except that each city also offers the chance to find goodies—tokens that will give you hints to puzzles or let you skip one altogether. If you don’t feel the quixotic pull of adventure, you can just play any puzzle in the game. Here is a quick rundown of a couple of the more interesting variations. 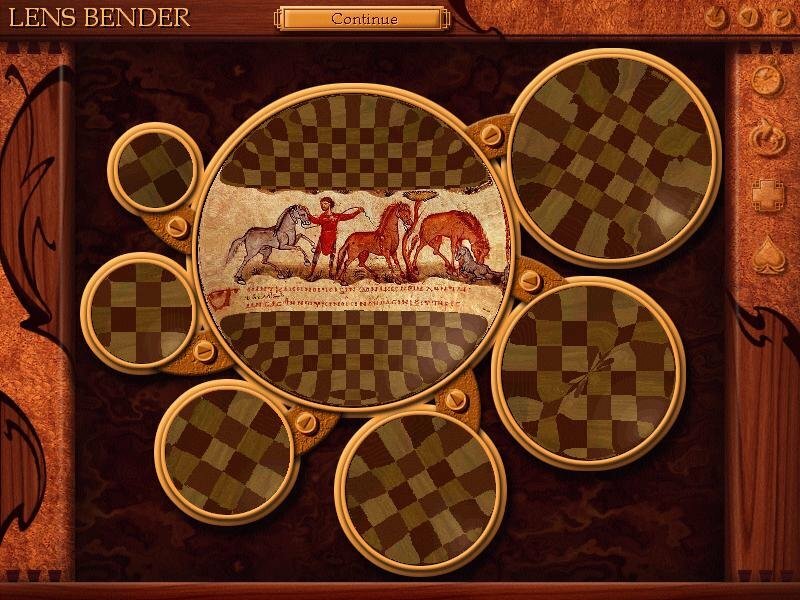 Lens Bender has its heart in the right place, but the execution is flawed. 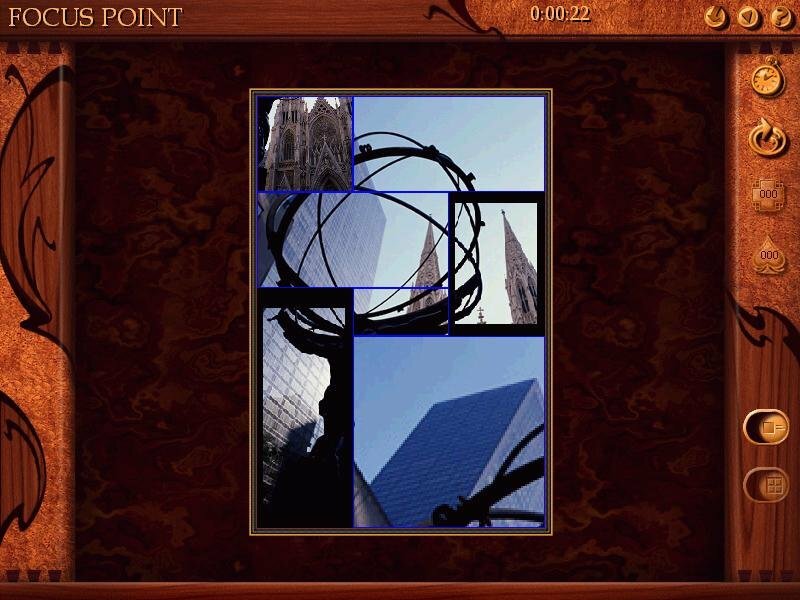 It’s like a jigsaw puzzle, except you can only place a piece if it is both oriented correctly and the piece it connects to is attached. The real twist is that you can only orient the pieces by placing them under a series of lenses. An interesting idea, but the lenses are often too distorted to make out what you’re looking at, never mind where it would actually go. Luckily, systematic trial and error works extremely well here. 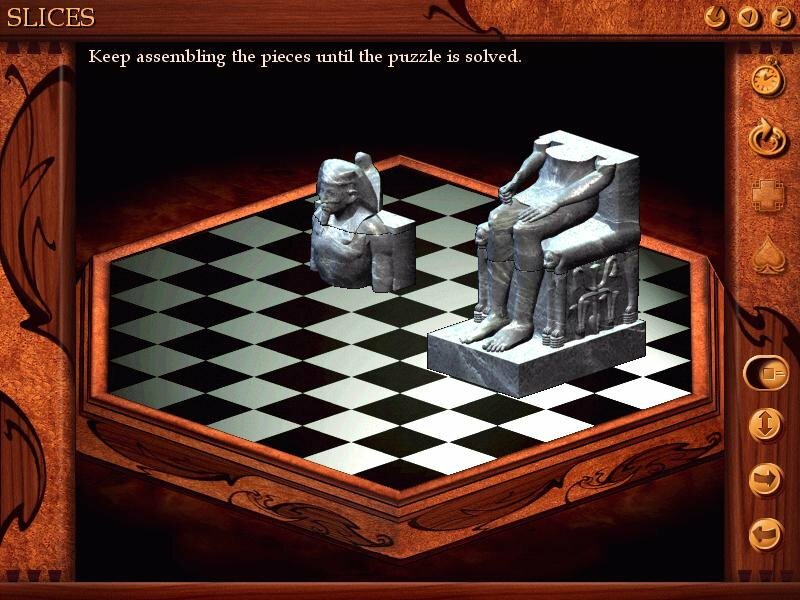 Even though it’s a 2D game, Pandora’s Box features this neat pre-rendered 3D jigsaw puzzle. 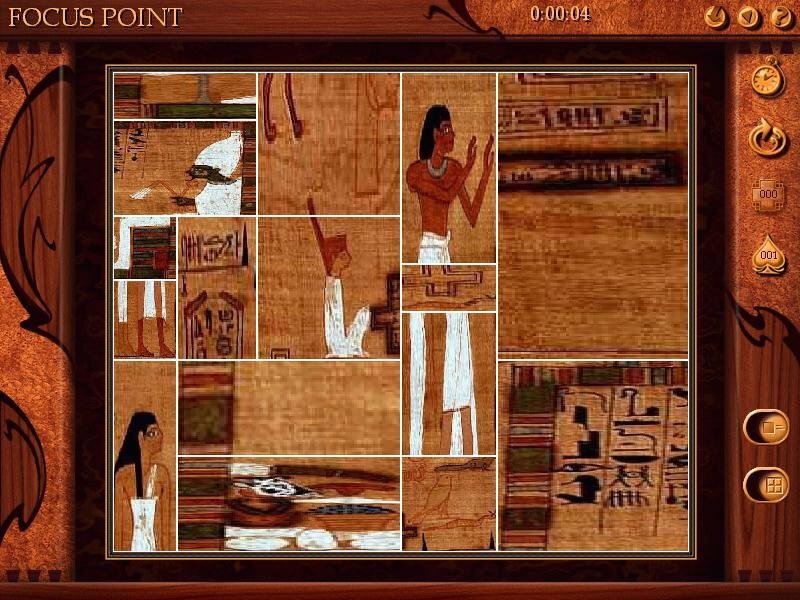 In Focus Point, which is quite original, a picture is broken up into several rectangles of various sizes and scrambled. The delicious demon is that when you switch two rectangles, the images grow or stretch to accommodate their new location. It takes a good eye for what looks “right” to make headway, but it’s fun. 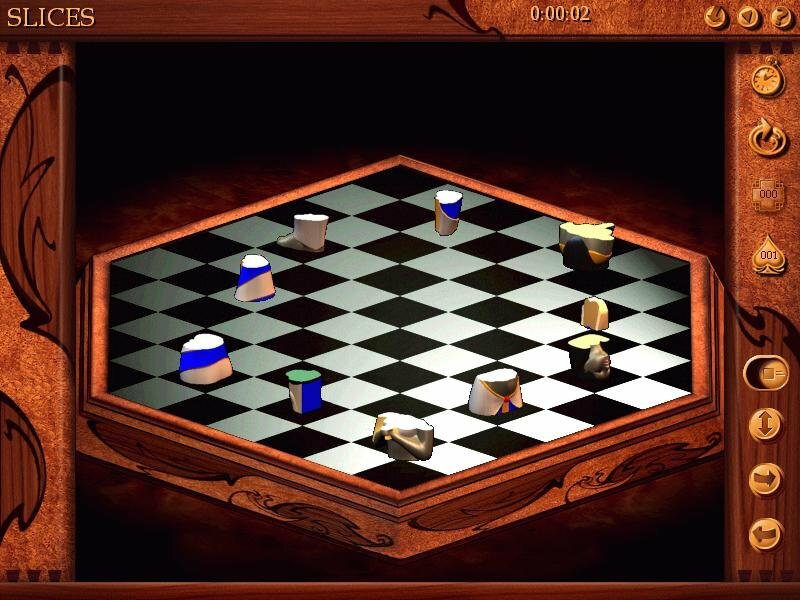 Image Hole is almost Tetris-like, requiring a bit of strategy, a bit of reflex, and a whole lot of luck. 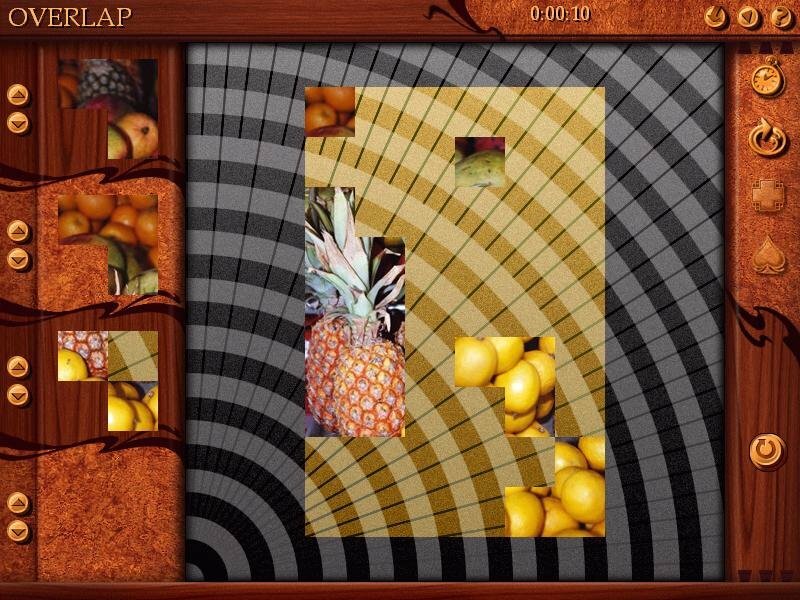 Shapes float around the screen, giving you short glimpses at an image below. 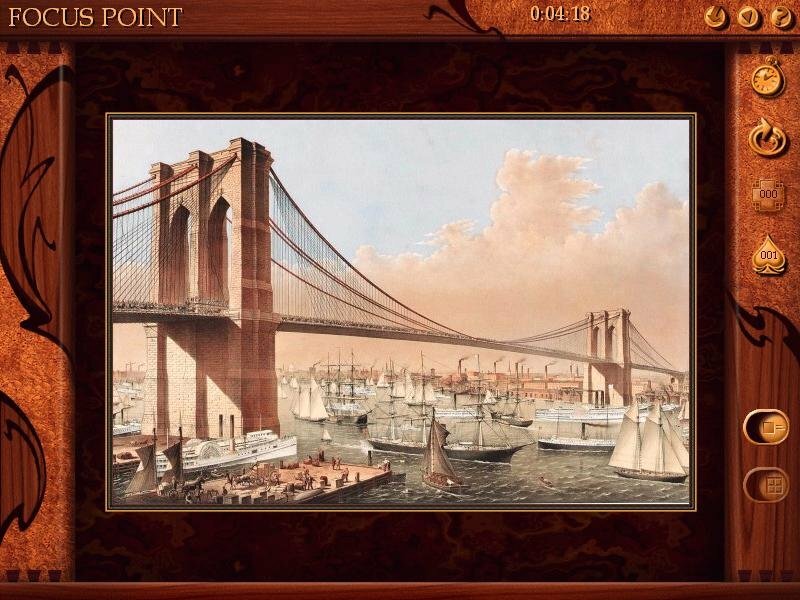 Your mission, should you decide to accept it, is to match the outlines to corresponding objects in the picture. Indistinct shapes and blurry images mar this potential gem. 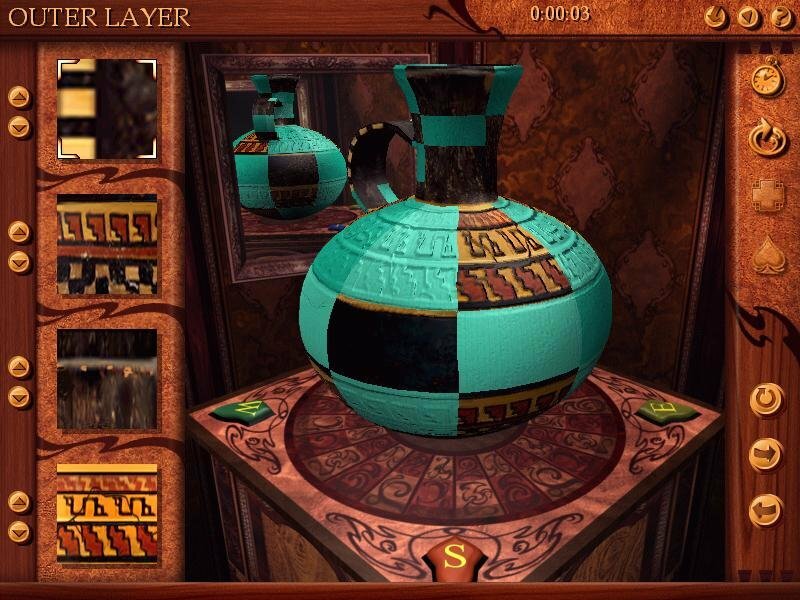 Although the game is completely 2D, you’ll also find a couple of pseudo-3D puzzles, like ‘Slices’, which features an item sliced into smaller bits that you need to assemble in isometric 3D space, and ‘Outer Layers’, a creative puzzle where you must texture-map a pre-rendered 3D object (like the vase seen above). 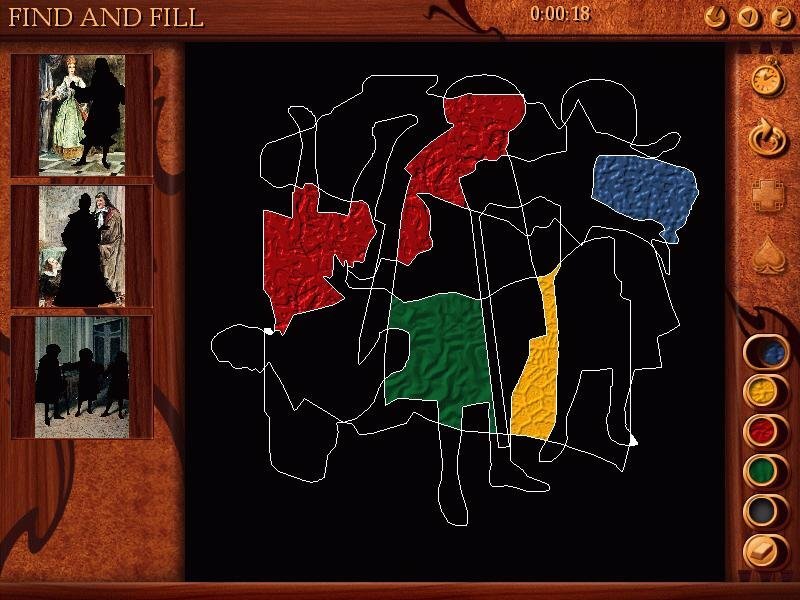 The other puzzles are various riffs on old themes, but are a competent caboodle. They aren’t all classics, but even curmudgeons will be content with this comprehensive collection of conundrums. 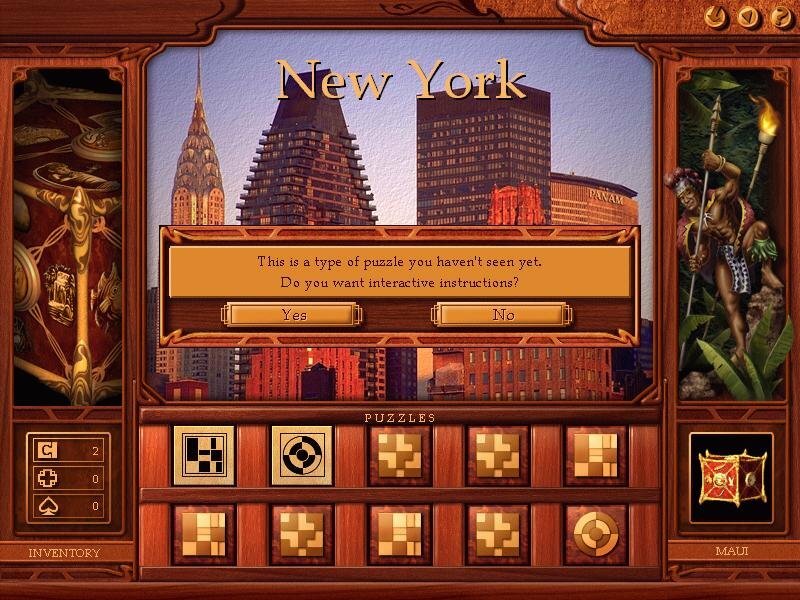 Throw the continuing dearth of good jigsaw games and the global adventure on the fire, and Pandora’s Box is a game that most puzzle fans should consider, if only for a weekend or so. I downloaded and everything in the installation was fine but when I try to open it, it says that I need administrator privileges but Im the administrator of the laptop. How I fix it? You have to run pandora10a.exe located in the Patch folder after installing.